Is ZFS Apple's secret weapon? Don’t expect Jonathan Schwartz to go quietly. The former CEO of Sun Microsystems has taken to his personal blog, provocatively titled “What I couldn’t say…,” to dish some industry dirt and tell his side of the story about the demise of Sun. He has already hinted at plans to write a book, and a new post Tuesday suggests a tell-all tome could indeed be in the offing. “I feel for Google — Steve Jobs threatened to sue me, too,” Schwartz writes, apparently referring to Apple’s patent lawsuit against HTC, which makes Google’s Nexus One smartphone. As Schwartz tells it, he responded by reminding Jobs about Sun’s considerable arsenal of OS-related patents. “Steve was silent,” Schwartz writes. A later meeting with Bill Gates and Steve Ballmer ended on a similar note, according to Schwartz. The Microsoft duo, then its CEO and president, had flown to Silicon Valley to meet with Sun’s executive team. “As we sat down in our Menlo Park conference room, Bill skipped the small talk and went straight to the point, ‘Microsoft owns the office productivity market, and our patents read all over OpenOffice,’” Schwartz writes. OpenOffice is the open-source productivity suite that Sun backed heavily as an alternative to Microsoft Office. Schwartz says he responded by asserting that Microsoft’s .Net development platform was a rip-off of Java. “It was a short meeting,” he says. Microsoft declined to comment on the post and Apple didn’t respond to an e-mail message. The former Sun chief had been keeping a low profile since Oracle announced its plans to buy Sun almost a year ago. 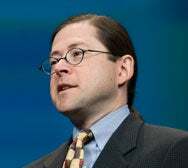 But he is apparently determined to tell his side of the story concerning Sun’s demise, a collapse that some attributed to the waning Unix market and others blamed on decisions by Schwartz himself. While Tuesday’s post is more of an inside look at how corporations wield patents, it seems future posts will start to retell the story of Sun. “Make that ‘definitely’ a book,” said 451 Group analyst China Martens.